Home entertainment does not have to always be entirely done indoors. This is because everyone enjoys feeling the outside atmosphere while listening to nice music and other entertaining audios. Having a home outdoor event is always good but gets awesome if the entertainment is boosted with an outdoor audio system whose sound quality remains uncompromised by the environmental elements. 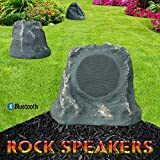 Home audio outdoor speakers are important entertainment tools that should not miss in your home outdoor event, be it a garden party or a barbecue. Selecting the best speakers may be hard for you and that is why the following list has been prepared. The list is about the top 10 home audio outdoor speakers. Aurtec TWS audio Bluetooth are nice speakers that come as a pair so as to give you an excellent stereo experience. Each of the speakers produces a total of 5 watts output power. The speakers use the v4.2 Bluetooth technology of connection and you can choose to use only one of them. The speakers are designed to enable you easily carry them anywhere as they are light in weight and not bulk. They come with individually built-in rechargeable batteries of 1450 mAh each and can run for up to 8 to 10 hours while playing at 80% volume. The AA351B Acoustic Audio comprises of a pair of black speakers which have a total of 500 Watts maximum RMS and 3”8 ohm. The frequency response of these speakers is 100-20,000 Hz while their sensitivity is 89db. They are covered with steel protective deluxe gratings that are rust and weather resistant. These AA351B Acoustic Audio speakers come with mounting brackets which makes their installation easy. The Sound Appeal’s Bluetooth 5.25” weatherproof speakers are made to produce high fidelity audio. They come with a weatherproof cabinet that features a neat white finish. 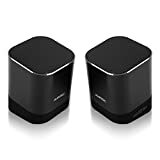 This pair of speakers uses v3.0 Bluetooth technology for connectivity and has a frequency response of between 45 and 20KHz. Each speaker contains an internal class D amplifier that produces 30w power. The slave speaker sources power from the master speaker which has to be connected to the 110v output. This is a powerful speaker that produces 10-200W. The OSD Audio AP840 200W weather resistant speaker comes with an 8” woofer that is made of polypropylene. It also contains a 1” supernil tweeter soft-dome. The speaker produces an awesome and unaltered bass and this makes it qualify to be an audiophile sound producing speaker. It comes with brackets that ease its mounting. 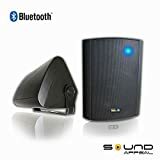 Sound Appeal Bluetooth 5.25 weatherproof is a pair of speakers that uses v3.0 Bluetooth to connect to an audio source. A class D amplifier that produces 30W is featured so as to give you a feel of great sound. 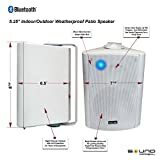 The weatherproof speakers share the same 110V outlet where the slave speaker sources power from the master speaker which is plugged to the outlet. The speakers comes covered using weatherproof black cabinets. Their frequency response ranges from 45 to 20 KHz. A 1” tweeter dome is also featured for clearer voices. This is a good pair of speakers. 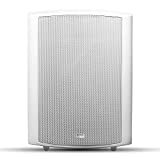 The Yamaha NS-AW150WH speakers contain a special design of acoustic-suspension that gives clear sound-controlled bass. A 5-inch polypropylene woofer that is filled with mica is featured and offers high-compliance performance. The 5-inch tweeter used is made using PEI and is dome shaped. It is magnetically shielded and is water resistant. The speakers give a frequency response that ranges between 80 and 40,000 Hz. Mounting brackets are included in the package to ease your installation process. Polk Audio Outdoor Atrium 4 Speakers are made to maximize frequency dispersion. The dispersion covers a large area and remains clear throughout. Their aluminum dome tweeters are anodized and also surrounded with rubber for absolute immunity to all elements. Frequency response ranges from 12 to 20 KHz because phase caps are used on tweeters to facilitate smoothness. The speakers come in pairs. Each of them features a mounting system that has speed locks for easier installations. 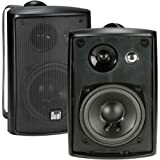 This is a pair of speakers that is built to maximize frequency dispersion in a full range manner, and over a wide area. Each Polk Audio outdoor atrium 4 speaker is designed to provide smooth response and better handling of power. This is achieved through the use of aluminum dome tweeters that are anodized and surrounded with rubber. Phase caps are also used on the tweeters so as to make the frequency response smooth. This makes it range between 12 and 20 KHz. Mounting each speaker remains easier because its mounting system contains speed locks. The Dual Electronics swivel brackets LU43PB speakers are digitally optimized to provide high performance. 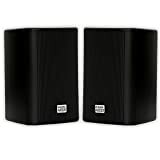 They are 4-inch multipurpose speakers that provide a peak power of 100 Watts, an RMS of 50 Watts, a frequency range of 100 Hz-20 KHz and 4-6 Ohms. This pair of speakers comes with a 4” woofer, �” tweeter and 1” polypropylene cone midrange. Each speaker comes with its own swivel brackets that are versatile. The list above features the top 10 home audio speakers reviews. Each product has broadly been discussed and can easily be understood. Choosing the right audio outdoor speakers should now be easier and quicker for you. Ensure that you choose the outdoor speakers that best meet your needs.